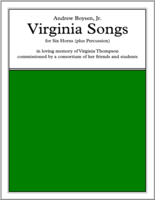 Virginia Songs, for Six Horns and assorted percussion. An insert of the score is included for each part to facilitate the performance of an aleatoric section. A nice recording of the premiere is available here!